These graphs compare Nature's Notebook data on flowering of 6 species of deciduous trees (Quercus alba, Q. rubra, Acer saccharum, A. rubra, Ulnus americana, Fagus grandifolia, Juglans nigra) with eBird (Cornell Lab of Ornithology 2012, ebird.org) data on a long-distance migratory bird, the Tennessee warbler (Oreothlypis peregrina), to demonstrate interannual patterns of phenological synchrony and overlap associated with the early spring of 2012 in the eastern U.S.
Due to early warm temperatures, mean flowering date advanced by 19 days in 2012, and peak flowering period by nearly 30 days. 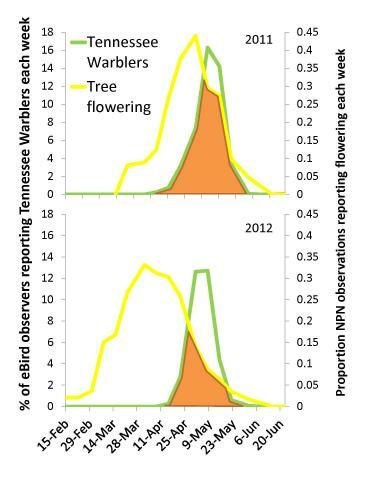 However, timing of warbler migration did not advance resulting in a >25% decrease in overlap (orange polygons). There was also a >12% decrease in the percent of observers recording warblers in 2012 (height of green lines).Advanced phenology along migration routes could provide important cues about northern breeding grounds. 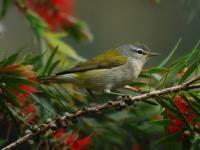 Migrants may limit stopover, pushing north to optimize their arrival time, thus limiting detections by birders.